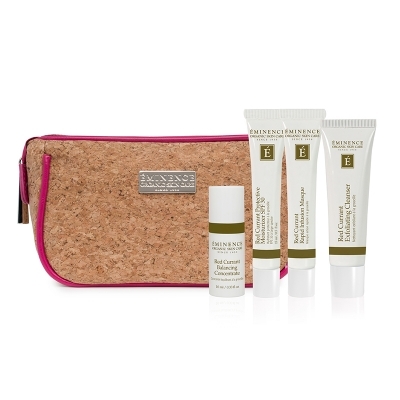 Eminence starter sets are the best way to try products within the Eminence line, as well as, a great way to keep using Eminence, even while on vacation. Each starter set has about a month's worth of product in it. 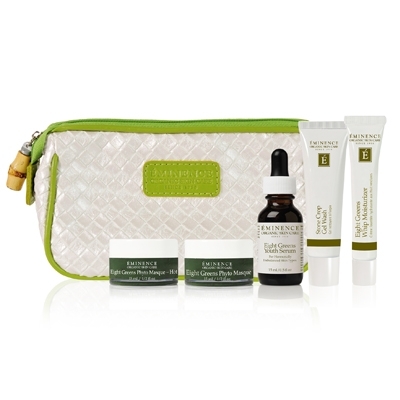 The Eight Green Starter Set comes with two masques, a serum, a cleanser and a moisturizer. The Youth Shield Starter Set comes with: a red current exfoliating cleanser, a red current rapid infusion masque, a red current balancing concentrate and a red current protective moisturizer. The Age corrective starter set comes with: monoi age corrective exfoliating cleanser, bamboo age corrective masque, bamboo firming fluid, coconut age corrective moisturizer and neroli age corrective eye serum.